Sometimes people think that landscaping a small yard won’t be worth the investment because they see the spatial limitations as an impossible obstacle. They fear they won’t be able to do anything meaningful with a small or oddly shaped lot. In this article, we’re going to present two example small yard landscaping projects that will put those notions to rest. The two examples chosen for this article feature large new construction homes that replaced out-of-date, less desirable houses on standard sized lots in desirable neighborhoods. Both have well-proportioned front yards. The backyards, however, are limited due to the expansive footprint of the new house. We’ll explore the creative challenges and opportunities presented by smallish or odd shaped backyards left over after an infill house replaces an older one on the same lot. With some of the infill building going on around the Washington DC area suburbs, an old house is torn down and replaced by a larger home on the same lot. To get a marketable new house on an old lot, the builder has to strike a balance between the size of the house and how much yard to leave. Usually, the front yard setback requirement dictates how the house will be sited. And that often leaves the shorter end of the stick to the backyard and side yards. 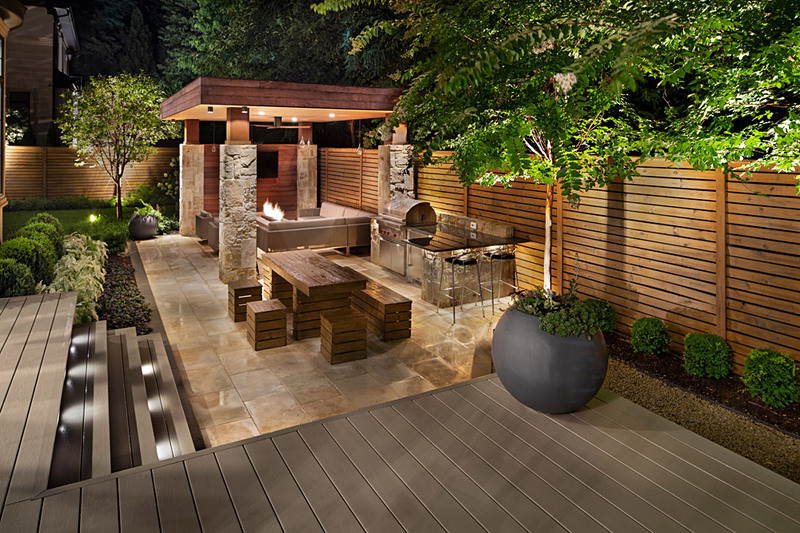 But that also provides an opportunity to make the most creative use of yard space within those limitations. Before we review the two example landscaping projects, let’s consider some points that are crucial to developing landscaping design ideas that will work in small yards. Make the most of a limited area by going with the restrictions rather than pushing against them. That is, embrace the appeal of coziness and privacy. Be selective about the elements you include instead of attempting to “do it all” and risk crowding the yard, making it feel even smaller. Plan your outdoor rooms by dividing the space into separate but related use areas each with its purpose and contribution to the whole picture. By using slight elevation changes, built structures, and screening plants, you can create visual points of interest that draw you into the scene. At 24 feet deep, the project #2 backyard allows only the absolute minimum space for the landscape architect to work with. Adding sound to an outdoor environment brings a new layer of sensory engagement—and in smaller yards, it adds the sensation of depth to the space. Go for height along the property line. Your designer may use terracing, raised beds, and tall plants around the perimeter to raise the eye line. This contributes a feeling of openness, much like a high ceiling would do in an indoor room. Layer lush border plantings in front of stone walls or fencing to disguise those hard visual barriers while gracefully creating a pleasing sense of enclosure. In both of these example projects, the obvious challenge to the landscape architect was the small size of the area. The water feature in the PROJECT 1 backyard was unusually challenging due to the location and limited space. The landscaping crew had to maneuver large boulders into place, and the feature goes vertical very quickly due to the limited depth of yard. But it turns out that this steep, high feature makes an impressive focal point and disguises the limitations of the yard—actually, making it seem larger than it is. In PROJECT 2, the rear deck covers a pre-existing basement stairwell that takes up nearly half the buildable depth in the yard (24 feet to the rear boundary). The landscape architect converted the stairwell to storage underneath the deck area. The architect says that this existing condition presented the greatest challenge of the two projects. When you look at the landscape plan, you can see and feel it if one of the features is either too large or too small. There has to be a balance between all the elements and the overall design so that it flows nicely and one part doesn’t detract from another. Landscape architect Chad Talton says he tries always to be thoughtful and creative in his attempts to maximize all the usable area on a property. Obviously on small sites, every square inch matters. Talton says, he puts a lot of care into balancing size, scale, and shape. He evaluates and plans how he can best use positive and negative space in the overall composition. These concepts are demonstrated in both of these projects. A lot of times, I believe we are trying to create a feeling of comforting confinement by dividing the area into individual spaces. You want to avoid crowding the area with too many elements too close together. You don’t want to feel like by the surrounding landscape is smothering you. Creative small yard landscaping begins with a commitment to making the most of what you have. Counter to what you might think; small size can be advantageous because you can put more into it than budget might allow in a larger yard. It also presents an opportunity to design in greater detail with more variety using the highest quality materials to build up a lush backyard environment. In both of these projects, the homeowners’ wish lists included a water feature, an outdoor grill, a covered structure, and so on. They left it to the landscape architect to figure out how to fit all of those elements into the allotted space. Talton is proud of the fact that none of their requests had to be dropped from the scope of work for lack of space or lack of imagination. Do you feel “stuck” with your small or odd-shaped backyard? Don’t be. A talented landscape architect can see your landscape for what it is and what it could be. If you are interested in exploring the potential for creating a backyard retreat for yourself, contact one of our landscape architects to schedule an on-site consultation.